There are many opinions of what type of wood is good for your fireplace. Many say Hardwood is the best and never go for softwood. However, let´s take a look on the differences of each so we can consider the pros and cons of each. The simpliest way to identify a hardwood is by it foliage. The leaves are broad and they defoliate or fall off during autumn. The most common hardwood species for firewood use are: Oak, Maple, Beech, Ash and Elm. The reputation hardwood holds is that it is very dense. 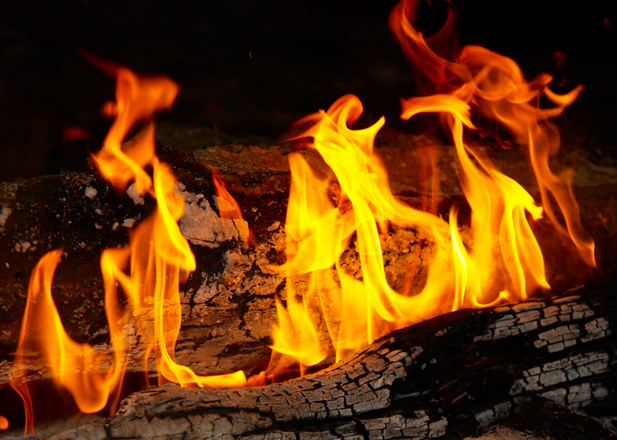 When you have dense wood, it is very ideal when you want heat that lasts long without giving smoke or sparks. Plus, it leaves you with hot coals that exerts radiant heat for a very long time, even allowing you to re-start a fire so easily. Not every tree that is classified as hardwood may not always be the best choice. If you choose a low quality hardwood it may actually be softer than a good quality softwood. Oak – This type of tree is very common. It is very dense and once it starts burning, it lasts very long with low maintenance required. However, to start the fire requires high heat and at most times using a softwood like pine can help. Maple – This tree has more than average heating values. It is hard to kindle but once you get it started it burns strong with little smoke. Cherry – This tree gives out a sweet smell that can be very appealing. It burns at medium heat. Elm – These trees are found in many places, produces ideal heat but is hard to split. Chestnut – is one of the lowest grades of hardwood. It burns and splits quickly, however gives a small flame with low heat and sparks a lot with smoke. Softwoods are conifer trees that have needles and a pine aroma such as cedar, red pine and fir. It grows really fast making the wood light and less dense. It is very easy to start a fire with softwood and will have large flames that spark and crackle. If you like to get smoke in your eyes than go for softwood as it also leaves you with ashes and no coals. It is not good for long fires. The volume it takes to occupy softwood may not be worth it if your tight on space. Since it doesn´t last longer as hardwood. Birch – has a different kind of bark amongst others and is an awesome fire-starter which burns very bright and hot. Pine – this tree is sappy and preferably best for outdoor fires. If you use it indoor there can be a buildup of creosote inside your chimney. Which one causes more creosote build-up? Many say that softwoods cause creosote buildup. The reason being is that the resins in softwoods can cause more buildup in your chimney. However the buildup is actually caused by the chimney flue cooling the exhaust gasses, that it starts to condense onto the walls of the flue. This can happen with both soft or hardwood. When the exhaust gasses are above 250 degrees Fahrenheit you´re fine, on the contrary if the gasses are below 250 degrees, condensation starts in your chimney and buildup increases.